When track testing our Project DC2 Acura, the limitations of the stock brakes quickly became an issue. 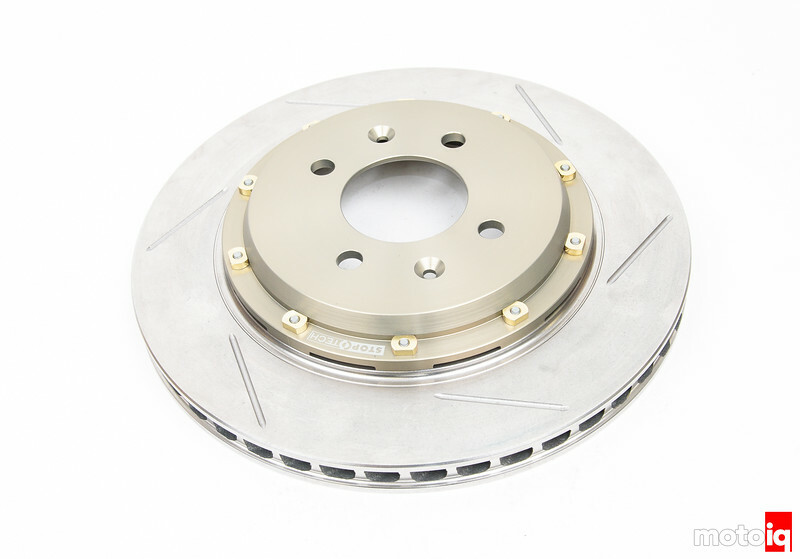 Even though we had originally rebuilt the old worn stock brakes with Stoptech OEM replacement street performance slotted rotors and street performance brake pads, the brakes would fade away in just a few laps of hard track driving with the braking forces that our Nitto NT05 tires could produce. Hard track driving with larger modern tires was asking a bit much from simple stock sized higher performance street parts. 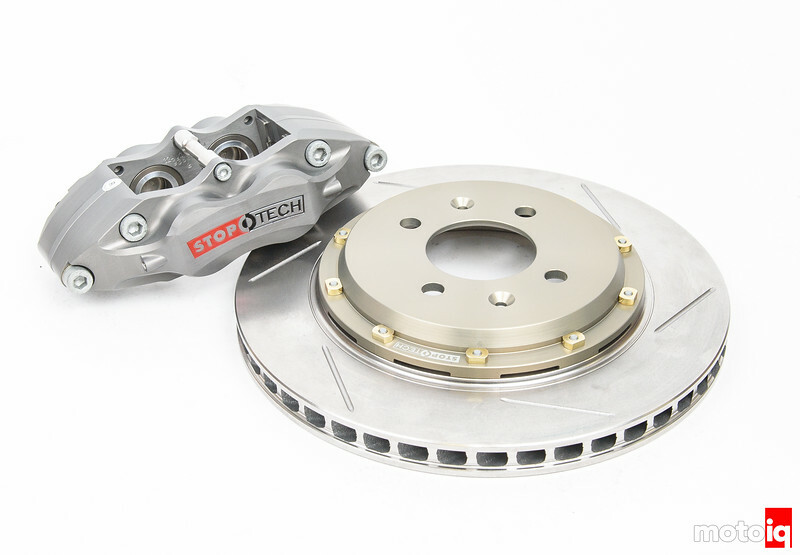 Since OEM replacement parts were not cutting it, we decided to get some serious help in the braking department from Stoptech. Since we decided that we wanted to run our original sized 15″ wheels we were handicapped for the size of the brake system that we could run. Often we run a large brake system so we can get away with a less aggressive brake pad so we won’t have to change pads back and forth for track days. With the 15″ wheel we are going to run as large of a brake as we can in the limited space. Will we be able to get away with a streetable pad on the track? We will see. We got a brake kit that Stoptech has but does not really market much. It is a kit developed for NASA’s Honda Challange classes where the cars are limited to 15″ wheels. The kit used for our Integra is a Stoptech Trophy kit. Trophy kits are differentiated from standard Stoptech brake upgrades by their caliper which is CNC milled after forging to get rid an average of .7 lbs of material and the silver and gold hard anodized finish which is very hard giving good wear and corrosion resistance. The Rotor is Stoptech’s Aero rotor for better cooling which is also bigger than stock while fitting into a 15″ wheel. The Aerorotor is 290mm in diameter vs the stock 260mm, a significant size difference of 30mm. The Aerorotor is also lighter at 10.5 lbs vs the stock 10.75 lbs even though it is a much bigger part. The weight difference is due to the two-piece Aerorotors CNC machined 7075 aluminum hat which replaces the iron center of the stock rotor. 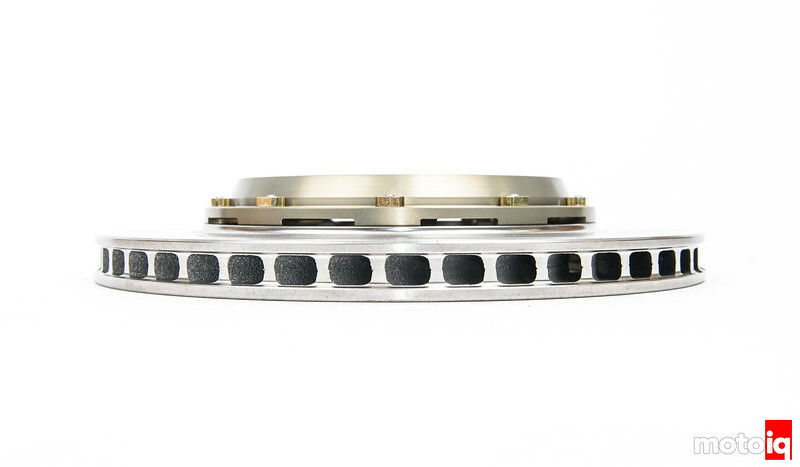 The Stoptech Aerorotor’s iron friction ring is 22mm thick vs the stock rotors 21mm thickness. The Aerorotors friction ring vane geometry is designed using CFD to optimize their shape for best airflow through the rotor for good cooling. The rotors ID is fully machined for best balance. Curious if you have any issues with proportioning now. I am running the same kit on my 2000 Civic DX hatchback. I had horrible pedal feel so I installed an Integra type-r 1″ brake master cylinder. Now the pedal feels great but the rear brakes lock up before the fronts which is obviously horrible for lap times. Could it be my stock drums in the rear causing this issue? Wondering if I need to convert the rears to disks or get an adjustable proportioning valve. On your car, drum brakes are self-energizing (the shoes wedge in place on initial application) so the proportioning valve in the ITR M/C sends a lot more pressure to the rear brakes than what drums need. Converting to rear discs should clear it up. Great write-up! The breaks on my old GSR were great for street use but, even on long trips, would get soft when they heated up. I know, back in the day, that quite a few Civic owners would seek out stock GSR calipers to swap in. I kinda don’t like banjo fittings myself. Break easy and more places to leak. Yes, don’t ask me how I know! I broke them, apparently by over tightening trying to get the copper crush washers to seat and quit leaking brake fluid. I have done this twice and was surprised about how little force it took. What are the kit and rotos p/n and where can we get it? The part number for this specific kit is 87.057.8P00.R1. You can follow the links to StopTech’s web site to look for more info or an authorized retailer. Unless you are running a good hybrid pad i think you need to go pretty massive on your breaks before a stock pad can keep up to any kind of tracking greater than 3 laps. Pads are huge! They can make stock braking systems work on track as long as your fluid is up to snuff. I have seen a few occasions where people have blamed brake issues on boiling fluid when in reality it was the street pads turning into so much hot dust and gas. The lower offgassing temperature pad components tends to give up the ghost and then you get a soft compressible layer of remaining pad material. Fixed with a proper pad. I totally agree with you that race pads can make stock brakes trackable but pads that will make stock brake systems fade resistant under track conditions are not even close to being streetable. They won’t form a transfer film at low street temperatures and will quickly eat up the rotors, sometimes in just a few hundred miles. They will also be super noisy and dusty on the street. This kit is 2x the price of willwoods, how are they that much better? Getting perfect proportioning is a big part of it. with minor modification, i fit some 2-piston sliding calipers from 199x? G20t onto a Honda Intega DC2, or Civc EG5 brake bracket. Just wondering how is the wheel clearance with the stoptech bbk and various 15in wheel offsets? Would the stock 15×6 wheels clear? 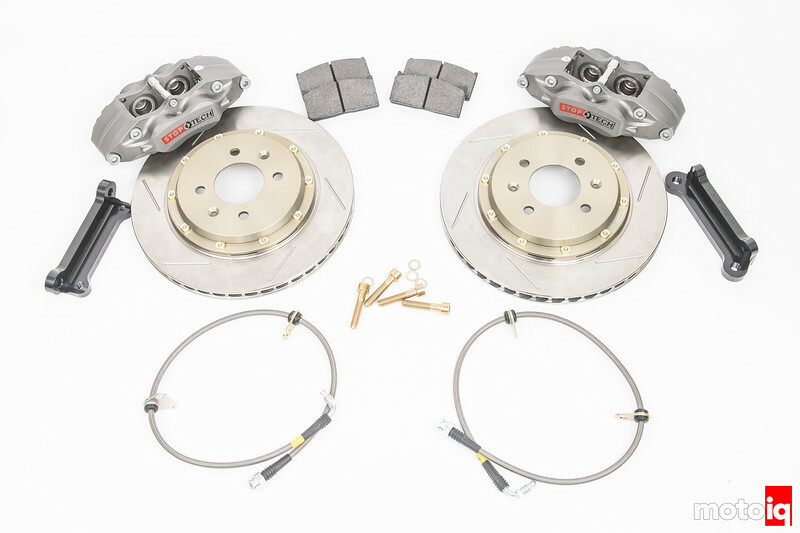 The kit looks similar to the fast brakes kit for SCCA STL hondas. There is pretty decent clearance.